Harris is now travelling back to Australia with fellow cave explorer Craig Challen and other amazing Australian team members from the Department of Foreign Affairs and Trade, Australian Federal Police and Australian Defence Force. Before he left Thailand, Dr Harris sent his heartfelt condolences to the family of ex Navy Seal Saman Gunan who died during the rescue efforts. 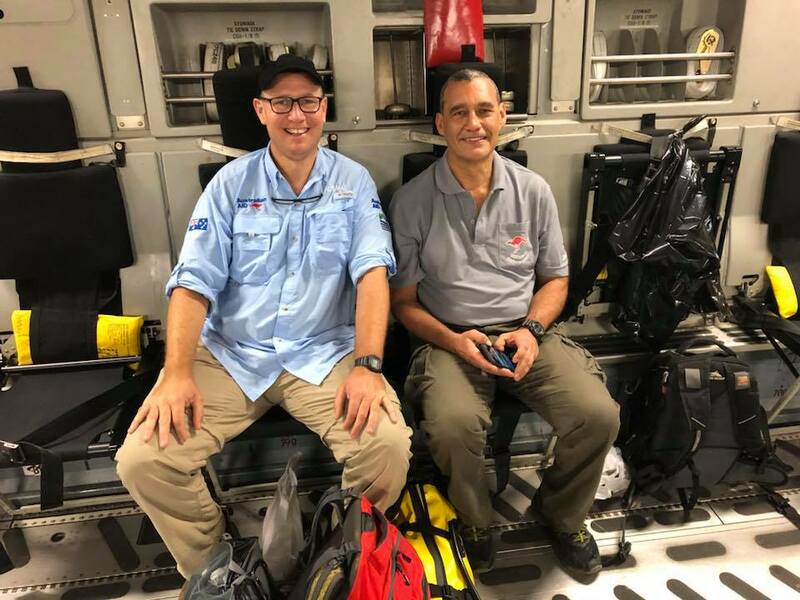 Richard Harris and Craig Challen were deployed as a small Australian Medical Assistance Team ('AUSMAT') to assist in the rescue in Chang Rai in Northern Thailand. "By the time we arrived on site, local divers like Ben Reymenants and the awesome foursome from Britain (John Volanthen, Rick Stanton, Jason Mallinson and Chris Jewell) had already been doing the most extraordinary dives through the cave, and laying the very robust rope which made all subsequent dives to the soccer team not only possible, but safe. The efforts and skill of these guys in blazing this trail cannot be underestimated. Following someone else’s line is very much easier than finding your own way. Rick and John not only found the children and coach alive, but conveyed the gravity of the situation to the rest of the world and thus the rescue started in earnest. The four Brits then did further supply dives to the soccer players, the coach and the four Thai Navy Seals, which allowed them to prepare and sustain themselves for the rescue ultimately. On the ground, the Thais and international community sent in swarms of men and women to provide everything from catering, communications, media and of course the huge teams of workers filling the cave with tonnes and tonnes of equipment to try and lower the water and sustain the diving operations. I have never seen anything like it with man battling to control the natural forces of the monsoon waters. Local climbing and rope access workers rigged the dry cave section for that part of the rescue and scoured the bush for more entrances to the cave. Drilling teams attempted to get through nearly a km of rock to the boy’s location. And all this time four brave Navy Seals sat with the Wild Boars knowing they were in as much danger as the kids. When it seemed all other options were exhausted, the decision to swim the players out was made and the rescue went ahead. As the kids came out, the four British rescue divers were supported by Craig Challen and I, three other very talented young CDG divers from the UK (Connor Roe, Josh Bratchley and Jim Warny) and the Euro divers (Erik Brown, Ivan Karadzic, our good mate Claus Rasmussen and Mikko Paasi). The pressure that was put on these guys was immense and they never dropped the ball for a second. When the kids and coach were delivered to chamber three, the US pararescue teams, the Specialist Response Group from the Australian Federal Police, Australian Clearance Divers, Chinese divers and Thai Navy and Military medics assessed the boys, then whisked them out of the cave to a field hospital before moving them to the massive hospital in Chang Rai centre. We were lucky to visit the boys, coach and Seals and all the beautiful medical and nursing staff in the hospital on our way home." Dr Richard Harris acknowledged that the spotlight had highlighted Craig Challen's and his efforts in this extraordinary rescue mission. "We want everyone realise that while we might have become the face of this rescue for some reason, everyone should know that the role we played was no more or less important than all the many hundreds (perhaps thousands) of people I have mentioned. The part we played has been made out to be a lot more noble than it actually was, we just consider ourselves lucky to have had some skills that we could contribute to the wonderful outcome." Dr Harris highlighted that the Australian National Critical Care and Trauma Response Centre, the Australian Medical Assistance Team, the Australian Department of Foreign Affairs and Trade, the Australian Embassy staff in Thailand, the Thai Tourist Police and local cavers also ought to be thanked and praised too. "We also wish to thank Drs James Doube and Andrew Pearce, 'MedSTAR' and the SA Ambulance Service for their significant assistance and support. We are most grateful to the team at the Specialist Anaesthetic Services and the 'Cave Divers Association of Australia' for handling the flurry of interest in our sport. The management team there has been amazing, as has our best friend, John Dalla-Zuanna. Dr Richard Harris and Craig Challen said they were appreciative of the worldwide community of cavers and divers who had handled themselves with grace and dignity and had valiantly tried to provide the mainstream media with accurate facts. "Thank you to the thousands of well-wishers from Thailand and around the world; we promise we have read every message! To our new band of brothers; the Aussie, US, UK, European and Canadian divers - lifelong friendships and respect!